Cells from the Palestinian Authority's so-called military wing were involved with planning and carrying out yesterday's bloody massacre in which five family members were brutally stabbed to death inside their home in the Jewish village of Itamar, reports sources from within those terror cells speaking to WND. The Al Aqsa Martyrs Brigades, the "military wing" of PA President Mahmoud Abbas' Fatah party, at first released a pamphlet taking responsibility for the attack and then quickly retracted the statement. Top sources in the Brigades leadership in the northern West Bank city of Nablus, however, confirmed to WND that members of the Fatah group planned and helped to carry out the attack. The sources claimed the attack was not sanctioned by the Fatah leadership but was planned by Brigades members who were acting as individuals. Also, the sources said the actual perpetrators of the attack were sleeper cells from Hamas, while the Brigades leaders planned the attack, provided logistical support and aided in the Hamas agents' escape. If accurate, this would evidence unusual cooperation between Hamas and Fatah rivals. The George W. Bush administration had labeled Fatah as a "negotiating partner" for peace in the Israeli-Palestinian conflict. Just two weeks ago, WND reported exclusively that members of Abbas' Brigades, now classified by the U.S. State Department as a terrorist organization, have been brandishing weapons publicly in recent days despite a disarmament agreement with Israel. According to informed Israeli security sources, messages were passed to the PA by the Israel Defense Forces and Israel's Shabak security services, that the armed Brigades members must lay down their weapons or face arrest. Israeli security officials told WND two weeks ago they fear the newfound militancy of the Brigades – evidenced by their publicly brandishing weapons – may be a strategic decision on the part of the PA to orient itself in a more extremist direction following Barack Obama's championing of unrest that toppled pro-Western regimes in Egypt and Tunisia. 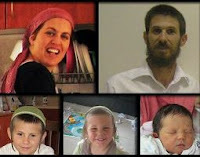 Yesterday's massacre, in the northern West Bank village of Itamer, saw Palestinian assailants stab to death the Fogel family – father Udi, 37, mother Ruth, 36, 10-year-old Yoav, 4-year-old Elad, and 3-month-old Hadas – inside their home. Two other children in the house at the time were not hurt in the attack, apparently because the terrorists did not notice them. Israel National News reported the initial findings of the investigation show the terrorists stabbed the Fogel family's sleeping 3-year-old in the heart and slashed the throat of his 3-month-old sister. The assailants apparently entered the Fogel's home through a living room window. They did not notice a 6-year-old boy sleeping on the couch and continued on to the bedroom, where they slashed the throats of the father and newborn baby sleeping there. The mother, Ruth, came out of the bathroom and was stabbed in the doorway. The evidence shows she tried to fight the terrorists. The Palestinians found 10-year old Yoav reading in bed when they stabbed him to death. They apparently also did not notice a 2-year old asleep in his bed, but murdered the 3-year old with two stabs to his heart. After that, the terrorists reportedly locked the door of the house and exited through the window. The Fogel's 12-year-old daughter returned home only to find the horrific scene. She reportedly ran out of the house screaming. According to reports, she was not able to initially enter the locked house so she woke up a neighbor, who assisted her in waking up one of the sleeping children inside the Fogel home who had had not been noticed by the terrorists. Meanwhile, IDF Brigadier General Yossi Kuperwasser, director general of the Strategic Affairs Ministry, said today that hours after the Itamar massacre, Abbas met with a member of a song group that contributes to an "atmosphere of terror." Palestinian Media Watch today reported on the rampant incitement to violence evidenced in the PA media in the days and weeks before yesterday's attack. Just one day before the assault, Sabri Saidam, advisor to and under-secretary of the Fatah Revolutionary Council, delivered a speech in which he emphasized that weapons must be turned towards the "main enemy [Israel]" and that internal differences of opinion must be set aside. In the week leading up to the terrorist attack, the PA announced plans for a football tournament named after the first Palestinian suicide bomber, Wafa Idris, who killed one and reportedly injured more than 150 when she blew herself up in Jerusalem in January 2002. Earlier, Abbas' representative, Azzam Al-Ahmed, member of the Fatah Central Committee, was the guest of honor at a Palestinian scout ceremony in which buildings representing Jewish residents of the West Bank were blown up. In December, Abbas granted the relatives of a Palestinian terrorist $2,000 as part of a regular PA campaign that supports so-called "shahids" or "martyrs" who die while attacking Jews.